Altar servers age 10 and up who assist in worship by carrying a processional cross, lighting candles, holding the Gospel book, and other tasks as assigned by the priest or acolyte chairperson. A quiet reverent ministry. We maintain and set up all the necessary things to help the priest conduct the services and to make our altar and surroundings as lovely as possible, to the Glory of God. Sharing God’s Sacramental blessings through the chalice, one person at a time. Licensed by the diocese and trained to assist the priest in serving communion and reading the Old Testament Reading at the Sunday and Wednesday services, and to assist at other services as requested by the priest. Orders or creates the altar flower arrangements for Sundays and for special occasions such as receptions and celebrations. Helps decorate the nave and sanctuary for Christmas and Easter. There are about 15 members and each person is asked to serve 3 or 4 times a year. Prayerfully and joyfully worship the triune God through music. Lead the congregation in worshipful song to enhance an atmosphere of praise and thanksgiving. Practice on Wednesday evenings at 7pm and usually sing an anthem three Sundays per month during the 10:45 am service. There is also opportunity for soloists and small vocal ensembles (trios, quartets, etc) to provide special music. If you enjoy good music, laughter and singing; please think about joining us. Instrumentalists are also needed and encouraged to participate. As God's shepherds bringing the sacrament and God's peace to parishioners wherever they are. Church members visit and administer Home Communion to temporarily or permanently house bound parishioners on Sunday afternoons. LEV’s must be licensed by the Diocese. Lectors read the second Bible Reading during the Sunday services, and Intercessors lead the congregation in Prayers of the People. Requires training. Members must agree to serve on a rotational basis. (Approximately once every month) Lectors must be licensed by the Diocese. Ushers offer a friendly greeting and a bulletin, along with help in finding a seat. Ushers take the collection and assist with communion. Oblation Bearers present the oblations (wine and bread) to the altar, and assist Ushers in the passing of alms basins. This ministry has also become very effective by assisting those needing a steady hand after communion. Working with the bride and groom-to-be and with the priest to make sure that the church and their sacrament of Marriage is a beautiful and meaningful occasion, to the Glory of God. 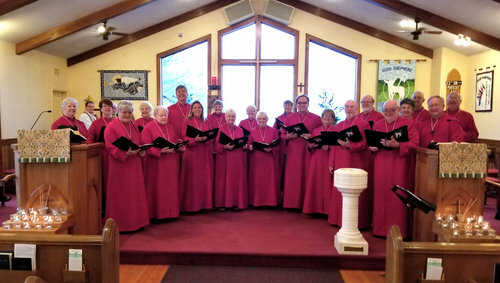 This is the contemporary service choir or "Praise" band that leads the music at Good Shepherd's every other month contemporary service. and at all lakeside services. Most of the music we sing can be found in our Blue songbooks, but new songs are added when appropriate. We typically practice two times before each contemporary service.